How is Nonfat Dry Milk Driving the Market? This post will be devoted solely to the current and unusual situation that is causing the international price of Nonfat Dry Milk (NDM)/Skim Milk Powder (SMP) to significantly influence U.S. producer milk prices. The pricing process is complex, which requires a fairly long post to adequately demonstrate the impact of NDM prices on producer prices. As discussed in the prior post, U.S. NDM pricing is being driven by exports. 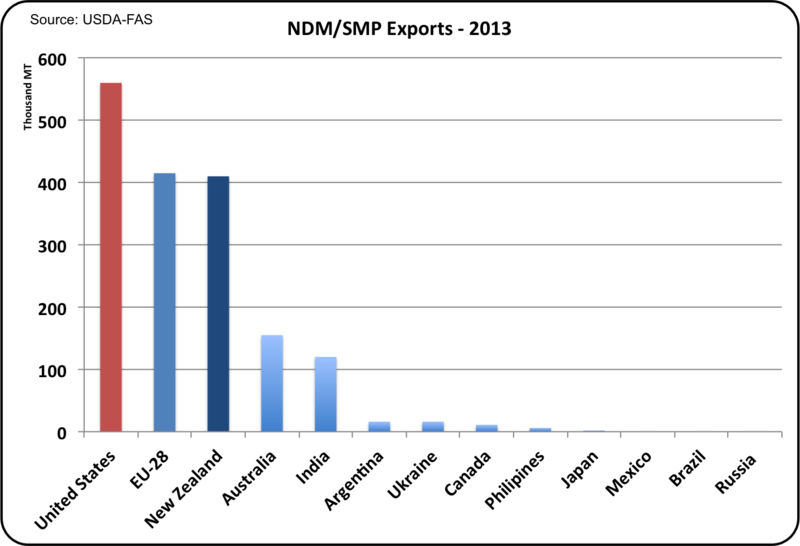 In 2013, 58% of NDM produced was exported. The international demand has been very strong and international pricing has increased as a result. 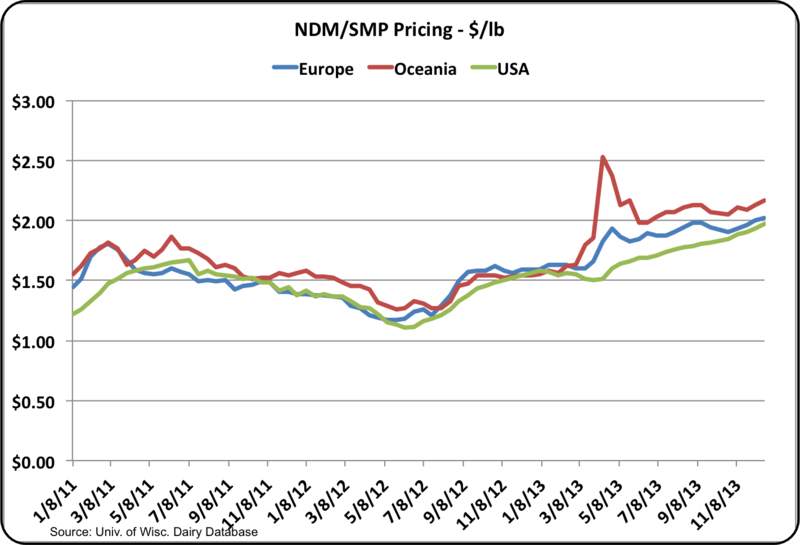 The chart below shows the comparative prices for NDM/SMP in Europe, Oceania, and the USA. The prices show the impact of international competition and the escalating price for NDM/SMP. The USA pricing is still the lowest and there is a growing demand. The Federal Milk Marketing Order (FMMO) system establishes producer milk prices for the majority of the milk in the U.S. These prices are formula driven based on the wholesale price of cheddar cheese, butter, dry whey, and NDM as determined by the National Agricultural Statistical Survey (NASS) . Four Classes of Milk are recognized in the FMMOs. Class I: Grade A milk used in all beverage milks. Class II: Grade A milk used in fluid cream products, yogurts, or perishable manufactured products (ice cream, cottage cheese, and others). Class III: Grade A milk used to produce cream cheese and hard manufactured cheese. Class IV: Grade A milk used to produce butter and any milk in dried form. Most (55% of the U.S. Milk in 2012) is paid on three components, protein, fat, and other solids. The prices are calculated at the end of the producer's month. This is referred to as the component pricing system. The other Federal Order producers (10% of the U.S. Milk in 2012) are paid based on the weight of skim milk and the butterfat content. These prices are calculated based on the wholesale prices of the products mentioned above for the two weeks preceding the producer's month. The California milk payment system is similar, with a few differences. The inputs for payment are based on block cheddar cheese and butter prices at the Chicago Mercantile Exchange, Western dry whey as reported by the Dairy Market News, and NDF as reported by the California Department of Food and Agricultural. All milk is paid on two components, fat and solids not fat. There is no specific payment for protein in the California system. The financial impact of the increase in NDM prices is different in each system. Due to the geographic proximity of ports to ship to the Oceania markets, California has the majority of the NDM market. The chart below shows Class IV (and the equivalent for California - Class 4a) for the FMMOs and California. California has the majority with 52%. Producers paid by the FMMO component system are initially paid at the Class III price. 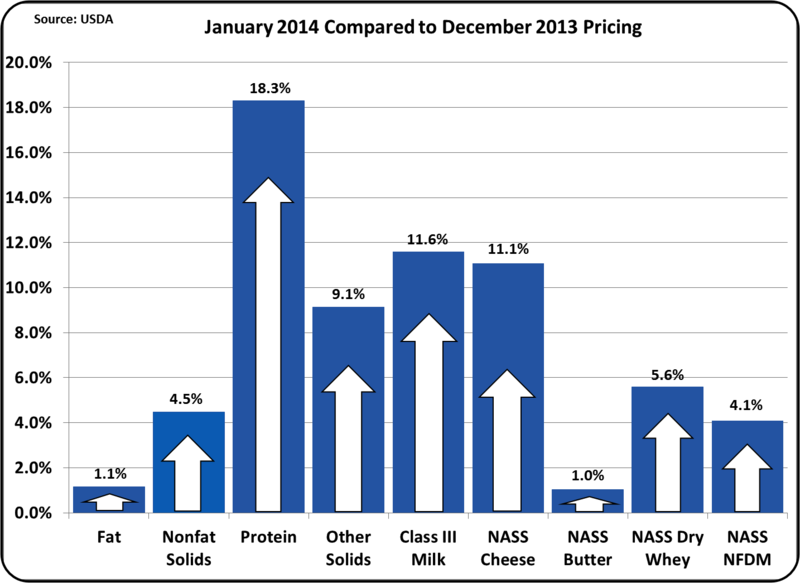 Nonfat dry milk pricing does not affect the Class III price in any way. However, it does impact the payment to producers paid on the Class III component basis, which is the majority of U.S. dairy producers. This apparent contradiction is explained via the formulas below. The simple answer is that all producers in these FMMOs receive a payment approximately 2 weeks after the close of the month called the Producer Price Differential (PPD). This is the difference between the weighted average of all four classes of milk (the "Uniform Price") and the Class III price. The high NDM is now driving the Class I, III, and IV milk prices up, so this is positively influencing the PPD. The formula for the Class I Skim Milk price is based on the higher of the Advanced Class III or IV price, so when the Advanced Class IV price is higher, which it currently is, the advanced Class IV price will really determine the the Class I price. The bottom line impact is that the nonfat dry milk price is now driving the Class I, II, and IV milk prices to higher levels, which in-turn drive the PPD higher. 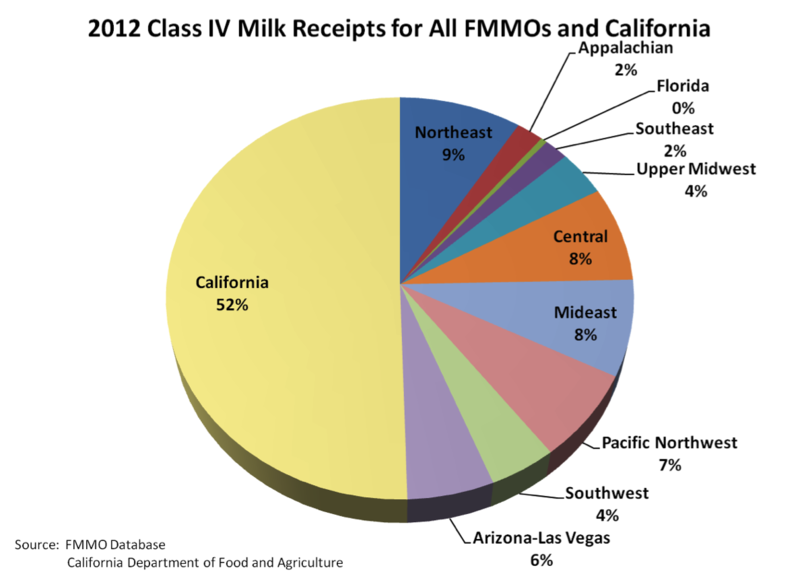 This impact varies by FMMO and those with the most Class I, II, and IV milk are benefiting the most. Milk in the four FMMOs that pay on the Advanced system are paid at the Uniform milk price. This is dominated by Class I milk which is paid on a skim milk + butterfat formula. 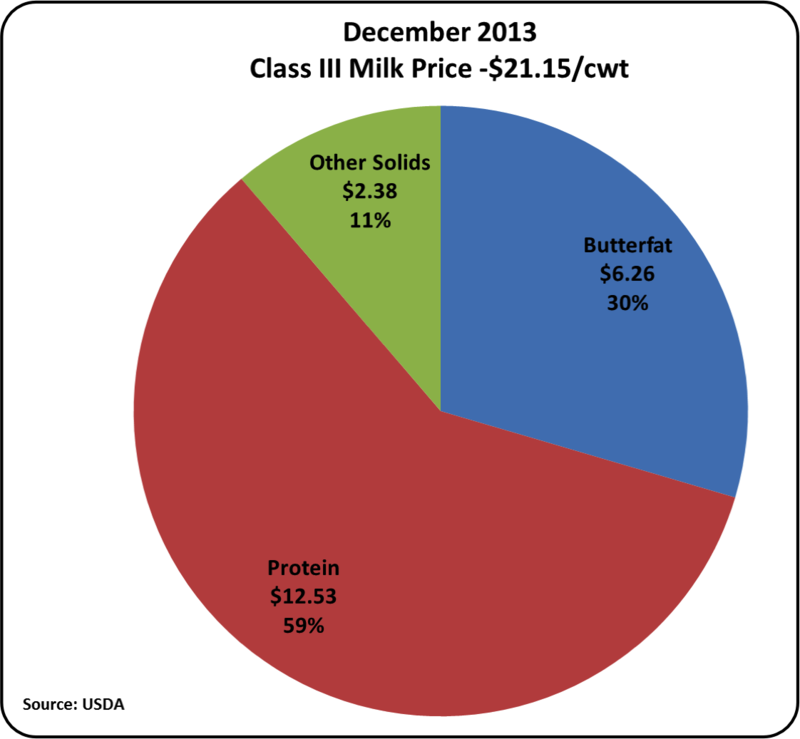 By December 2013, the differential between the advanced Class III and IV was $1.49/cwt., a clear advantage for Class I milk pricing. Who does this impact the most? The four Federal Orders paid on the advanced pricing system include Florida, Southeast, Appalachian, and Arizona - Las Vegas Federal Milk Orders. These Orders get the advantage of the higher Class I price. Arizona - Las Vegas also has the benefit of having a significant Class IV NDM business, produced primarily for export. Class II skim milk in the Advanced payment system is based on the Advanced Class IV price plus $.70. The high NDM prices have therefore increased the value of Classes I, II, and IV, bringing a significant benefit to the producers in the four FMMO paid on the advanced system. California uses 5 different categories of milk. Class 1: Milk used in fluid products, including whole, reduced fat, low-fat, and nonfat milks. Class 2: Milk used in heavy cream, cottage cheese, yogurt, and condensed products. Class 3: Milk used in ice cream and other frozen products. Class 4a: Milk used in butter and dry milk products, such as nonfat dry milk. Class 4b: Milk used in cheese, other than cottage cheese, and whey products. In all classes, only components are recognized as having value and only two components are recognized, Fat and Solids Not Fat (SNF). Formulas are used to calculate the prices for each class of milk. For Classes 2, 3, and 4a, the value of SNF is based on the NDM price. 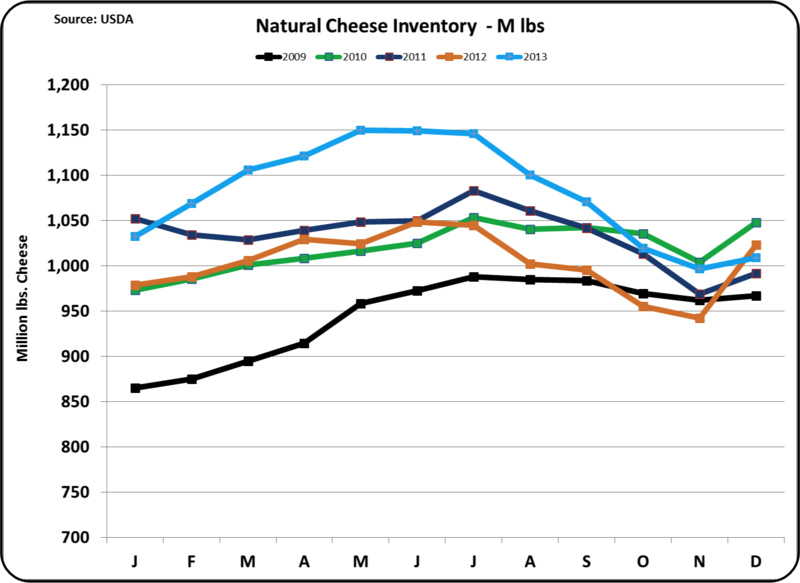 The Class 1 price for SNF is based on the higher of two formulas, one based on a cheese type valuation and the other based on a NDM valuation. The NDM valuation is currently higher, so Class I SNF price is based on the NDM price. Only the Class 4b price for SNF is NOT based on NDM. 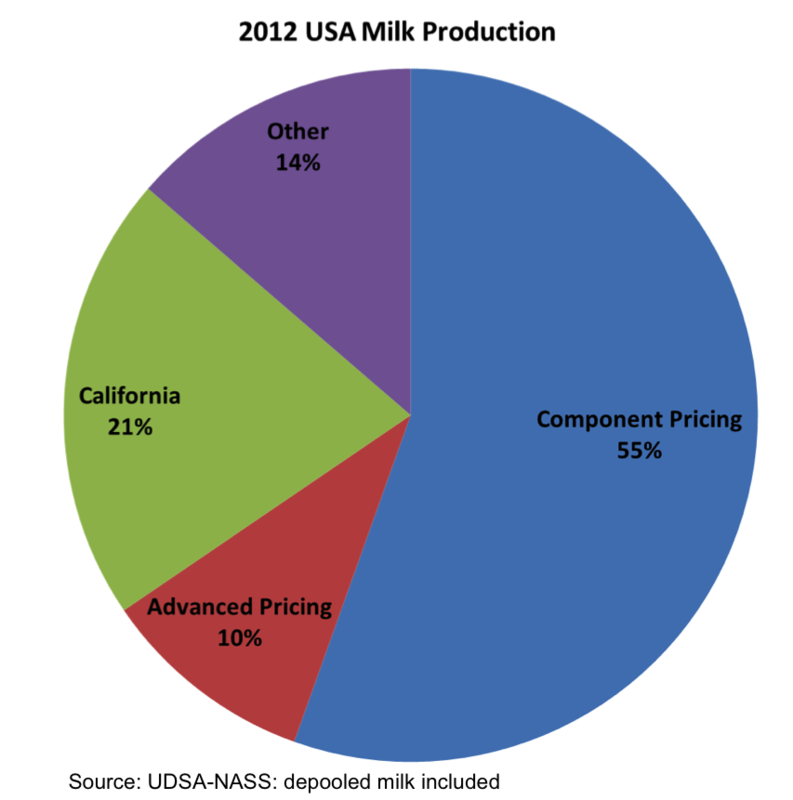 In 2012, the Class 4b milk represented 44% of the California milk usage, so the 56% majority of milk in California IS influenced by the NDM price. This analysis is intended to show the huge impact of international prices on U.S. milk prices. Although this post is not an in-depth analysis of U.S. diary prices, it is intended to show the growing international influence on dairy producer pricing. In the prior post, an analysis of exports was promised. Most 2013 data is now available. While the USDA-FAS data for 2013 is "projected," comparisons to final 2013 data from the United States Dairy Export Council and the U.S. International Trade Commission indicate that the FAS projected 2013 data used in this post is reasonably accurate. Dairy products are spreading from regional to national and now international markets. While the debates go on endlessly, (whether we are discussing energy, off-shore outsourcing, or dairy products), the fact is that most markets are becoming internationalized. Dairy has been slow to join this evolution because of the short shelf life of products and the high water content. 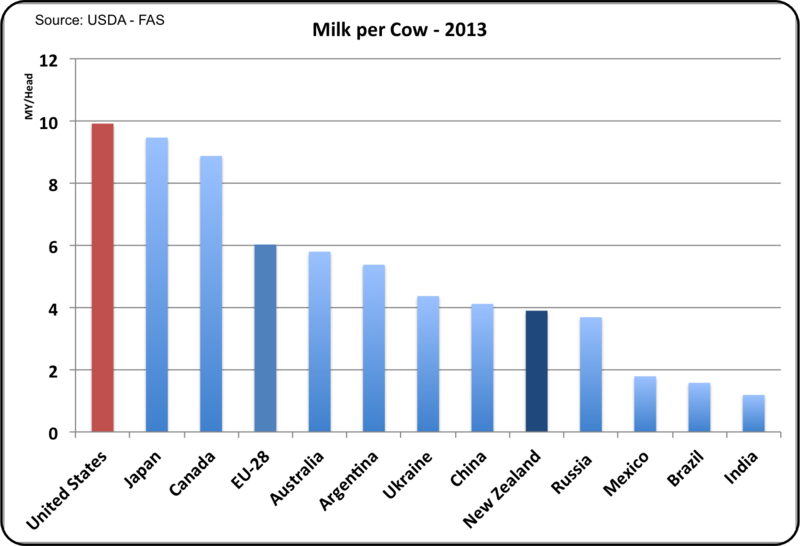 However, internationalization of dairy is here and growing fast. There is no stopping or turning back. It is best to embrace the change and learn how to make it work. The U.S. dairy industry enjoys some advantages that is making it a world class dairy products supplier. The U.S. dairy system is loaded with good management, technology, strong finances, and an entrepreneurial sprit to take risks and turn them into opportunities. This evolution will make the dairy business more volatile, but expansion and economics of scale can be used to keep the U.S. dairy industry modern, profitable, and growing. 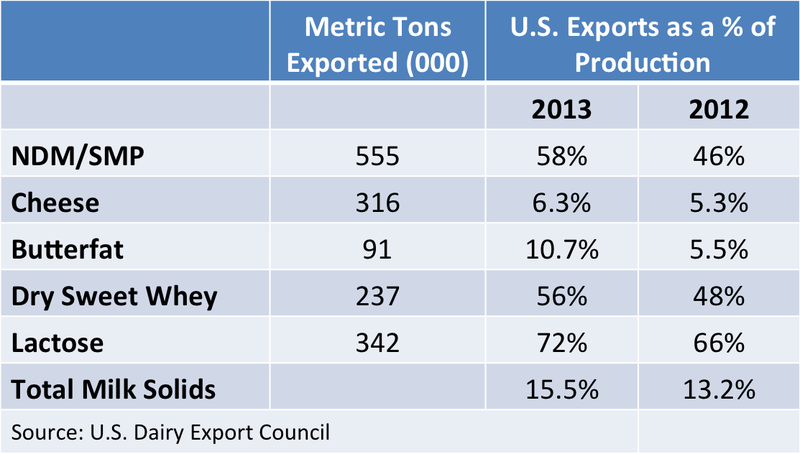 In 2013, 15.5% of dairy solids were exported. This post will analyze the global dairy export market and discuss some of the the U.S. dairy export achievements and opportunities. 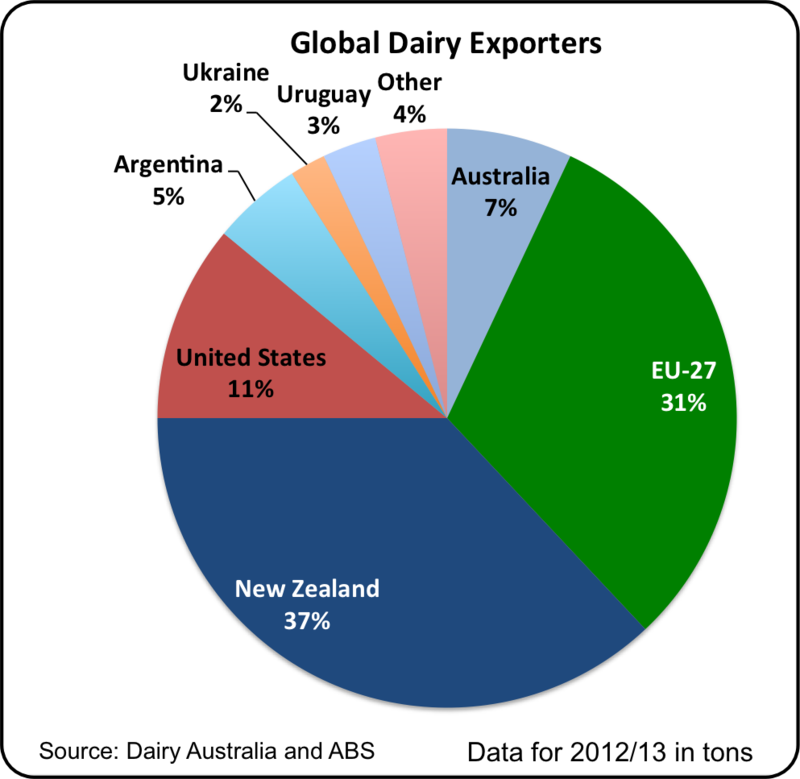 As an example of the global dairy environment, while the U.S. exported 15.5% of its dairy production, New Zealand exported 95%. Europe and New Zealand are the large dairy exporters that the U.S. must compete with. The U.S. is in third place with a much smaller piece of the pie than Europe or New Zealand. The U.S. slice is growing and the size of the pie is growing. This is a major opportunity for the U.S. dairy industry. Why is the U.S. in a good position to become a major international player? There are two major reasons. U.S. producers are very productive with large modern facilities and good management, and the U.S. dairy system is large enough and easily expansible to supply the increasing international demand. The chart below shows the average milk per cow. The U.S. has the highest per cow yield in the world, and the major competitors, Europe and New Zealand are far behind the U.S. numbers. 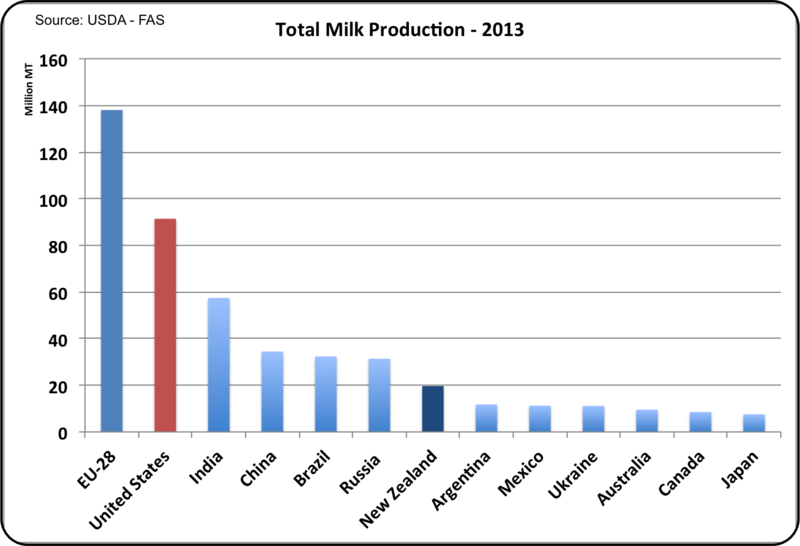 The EU-28 produces the most milk, but the U.S. is the second largest. With the current large base, a growth of only a few percent can supply a lot of milk. Due to the forage model practiced in New Zealand, significant growth will be difficult. Europe is constrained in some countries by policies intended to maintain the "way of life" for agriculture. 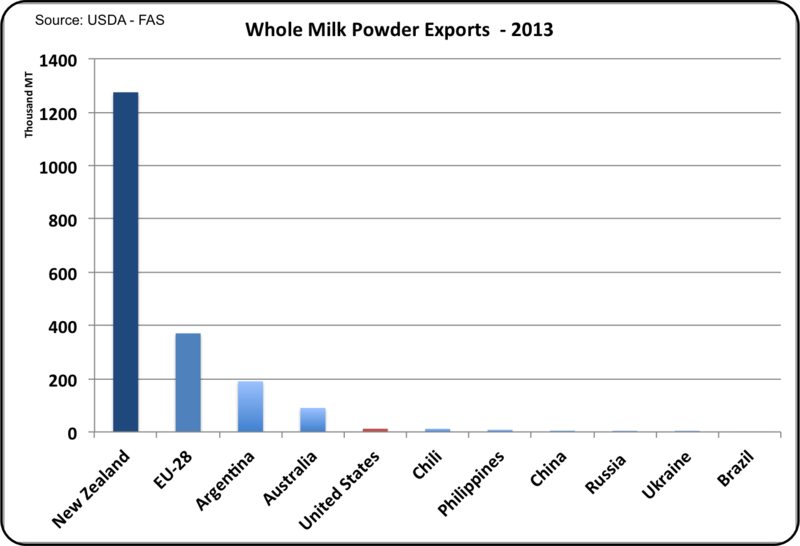 The U.S. is the leading exporter of Nonfat Dry Milk (NDM)/Skim Milk Powder (SMP). This the largest export category in volume. The year 2013 saw significant gains for the U.S. in this category which shows the flexibility and growth potential possible for the U.S. Dairy Industry. There is one large category where the U.S. is not participating. There is a significant global demand for Whole Milk Powder (WMP). Because there is essentially no domestic demand for WMP, U.S. milk processors have been reluctant to build facilities to service this market. International demand can be volatile and is clearly driven by pricing and can be influenced by exchange rates and political events. For New Zealand, this business is huge and geographically advantageous as much of this business is in the Asia Pacific region. The chart below shows China's imports of SMP and WMP. The growth rate is very significant and so is the volume. China's WMP imports are much bigger than SMP and presents an opportunity for the U.S. dairy industry. However, there are clear risks to this category. Expanded sales to other emerging market countries could somewhat reduce this risk. Cheese is a higher value dairy export and therefore is lower in volume. Because much of the producer milk pricing is driven by cheese prices, the increased cheese demand provided by exports can have a significant impact on producer milk prices. From the chart below, the growth in cheese exports from the U.S. have now made the U.S. the second largest supplier behind the EU-28. Additional growth in this category is very important, but the potential volatility can create significant swings in demand and pricing. 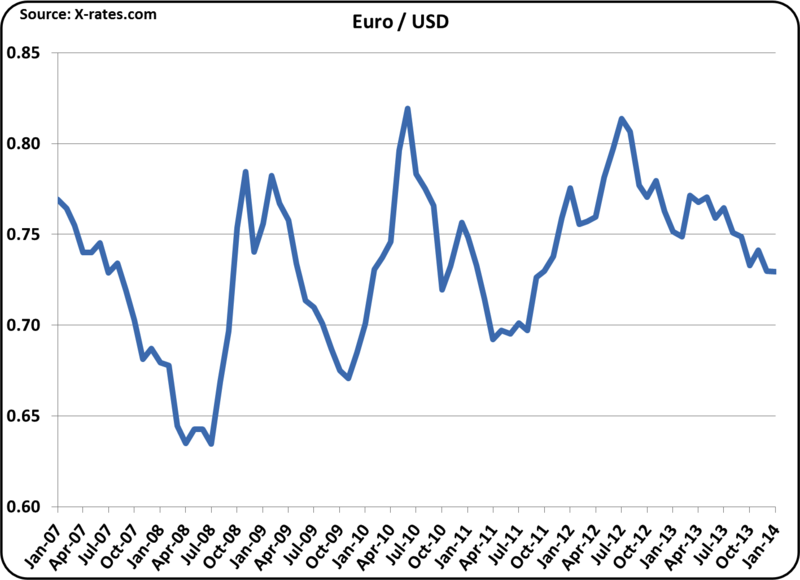 In addition to the risks of international competition and changing political policies, exchange rates also have a significant impact on exports. Because most international dairy sales are commodity items, pricing drives demand. A weak USD helps keep the U.S. competitive, but a strong USD can have a quick and disastrous impact. 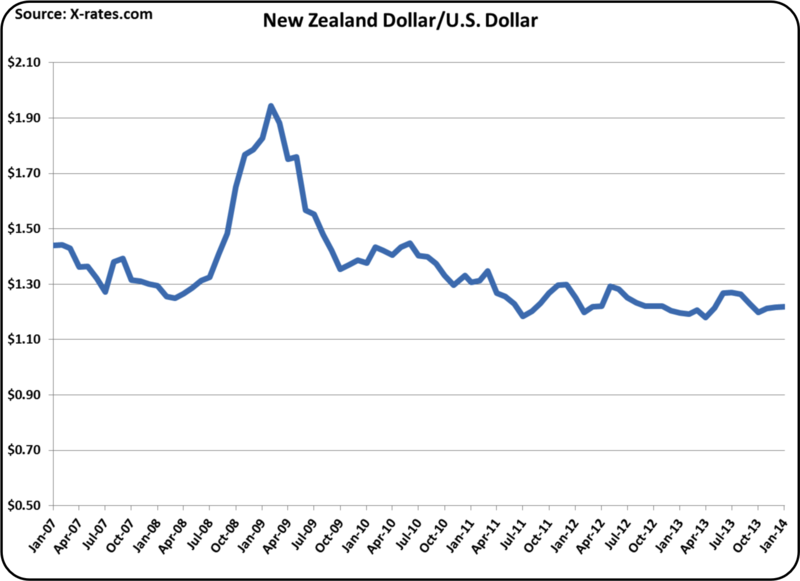 Currently, exchange rates between the USD and both the Euro and New Zealand Dollar are neutral to positive for U.S. exports. The dynamics of exports are quick to change and exports are now large enough that they can have a very significant impact on demand and pricing. New posts to this blog will continue to follow these events. Class and Component prices for January 2014 were announced February 5. All parameters on the dashboard were up, with milk protein increasing the most to $4.19/lb. The Class III milk price was $21.15/cwt. The January prices were at or above the long term trends, for all components. Protein prices were above $4/lb. for the first time since the 2008 price spikes. With the large increase in the value of milk protein, the pie chart showing the value of each component shows a record 69% of the Class III milk price coming from milk protein payment. Producers should be doing everything possible to maximize protein production. Exports continue to push the demand for dairy products. An analysis of exports will be posted to this blog as soon as new data is available. Also, the strong international demand for Skim Milk Powder/Nonfat Dry Milk is keeping U.S. Class IV price unusually high. For an explanation of this impact, see the October 6, 2013 and January 5, 2014 posts to this blog. An upcoming post to this blog will further analyze the 2013 impact of this major change which has been very positive for dairy producers. The dynamics of cheese, butter, and dry whey will be analyzed below. Please see the April 23, 2009 post to this blog to understand the the impact of cheese, butter, and dry whey on milk protein, fat, and other solids. The strong demand for dairy products and the resulting strong pricing is driven by exports. as previously mentioned, exports for 2013 will be reviewed in an upcoming post to this blog. 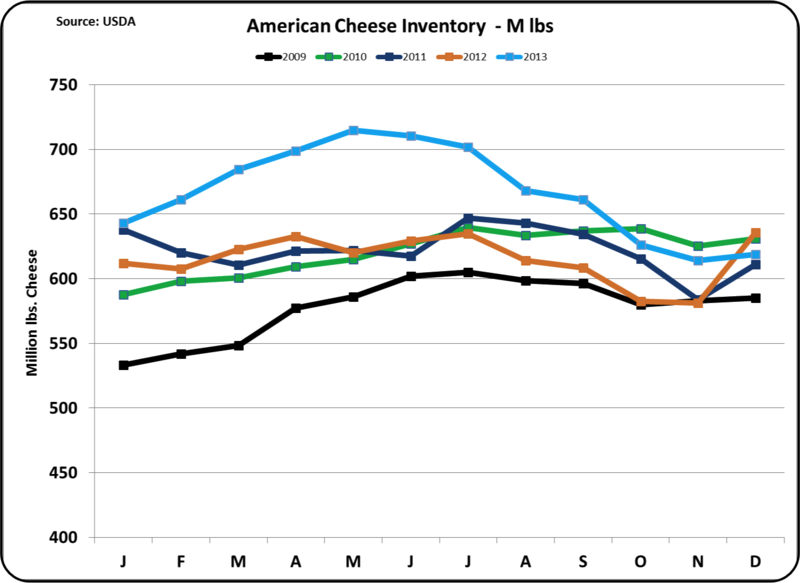 Inventory levels for Natural and American Cheese are slightly low as shown below. 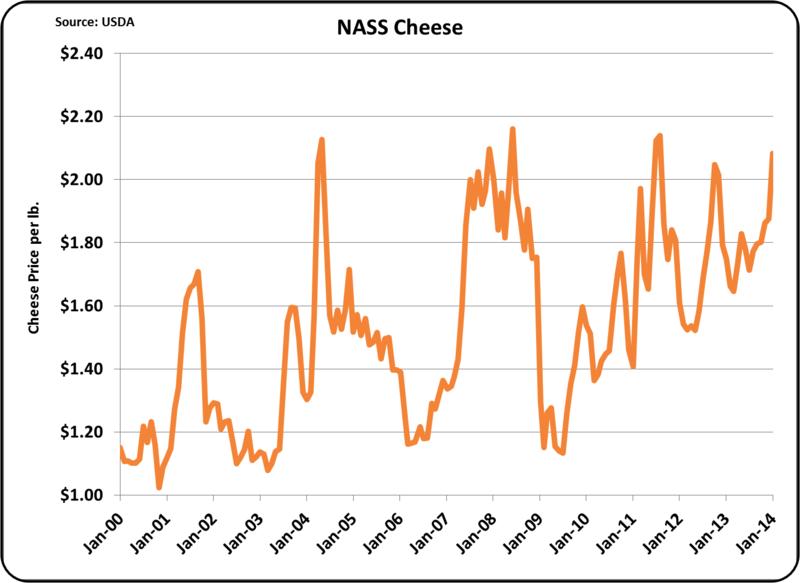 With the low inventories and strong export demand, the NASS cheese price for January was near the all time highs. 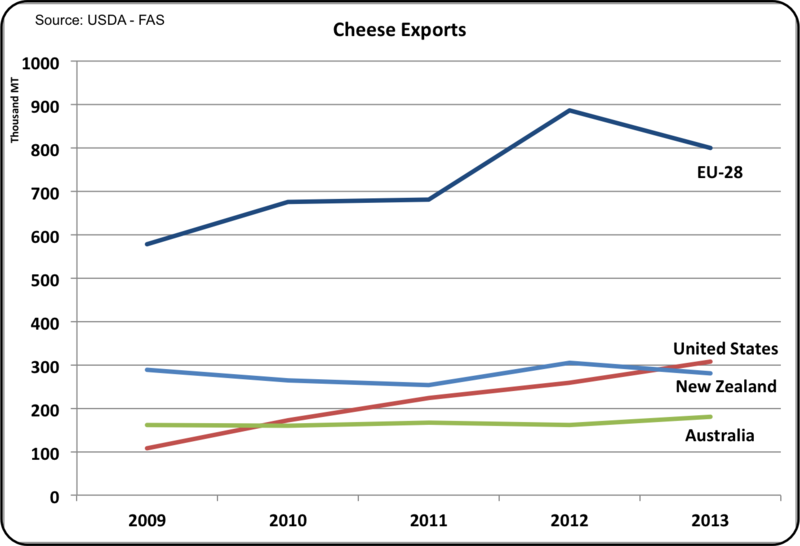 Cheese exports hit all time highs in December, 2013. Cheese was valued by NASS at $2.08/lb. for the month of January. The CME prices for blocks and barrels of cheese are above $2.20/lb. so the February NASS price may set a new record. 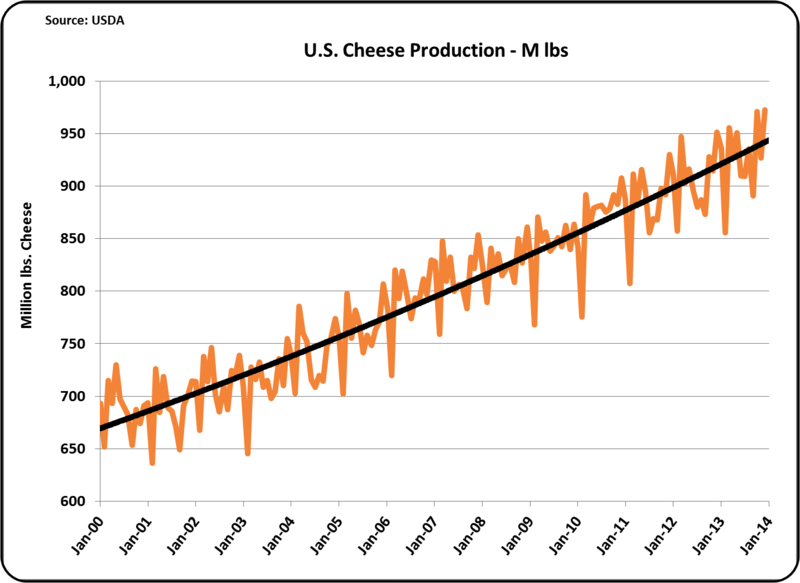 Cheese production has stayed on the normal growth curve, with no major spikes that could cause a price bubble later. 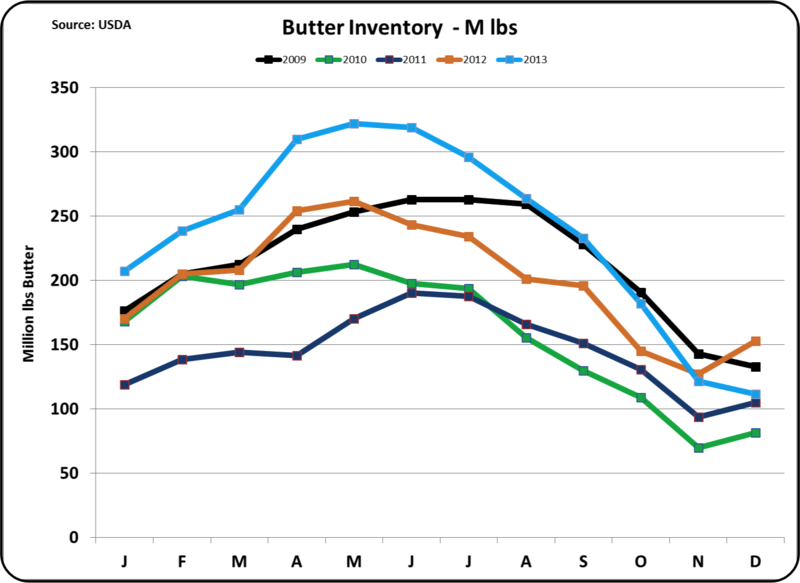 Butter Inventory is extremely low, below the levels of 2011 and 2012 for December. This has kept prices healthy, at $1.65/lb. in January 2014. However, the prices are not near the record highs. 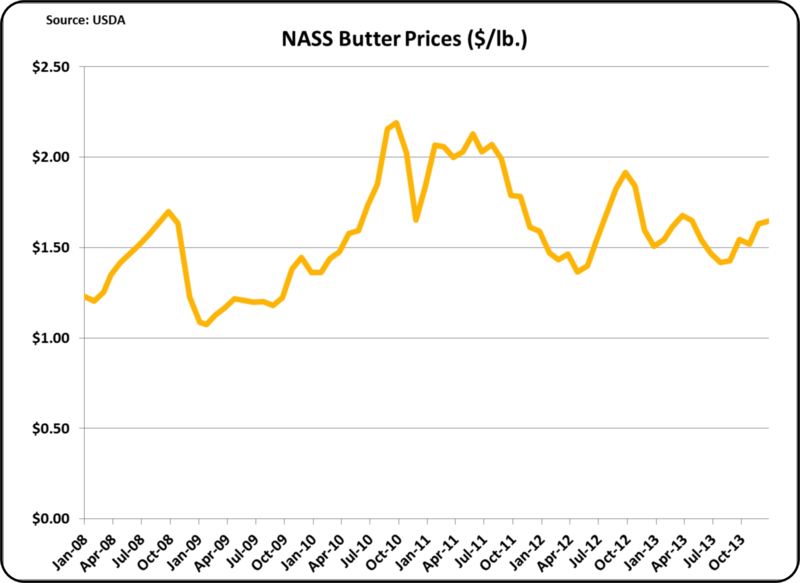 There is no sign of an approaching bubble in butter prices. 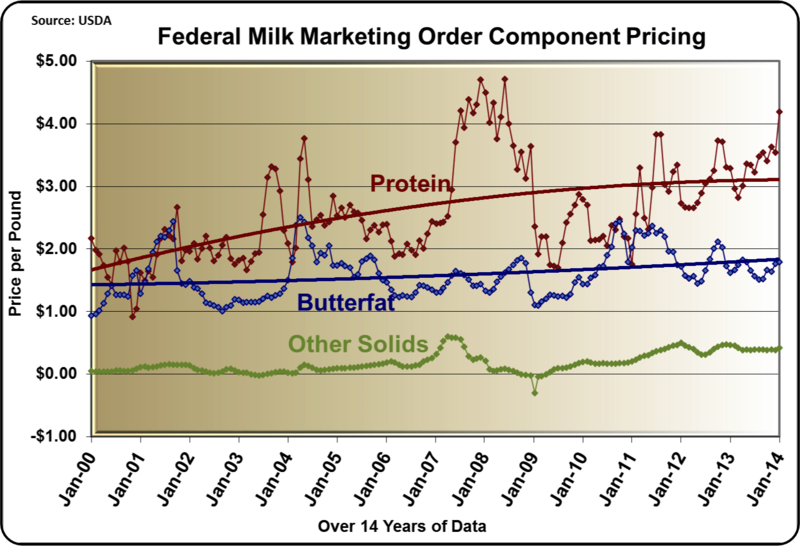 The price of butter is the basis for the butterfat price, and also has an impact on protein prices as explained in the August 8, 2013 post to this blog. 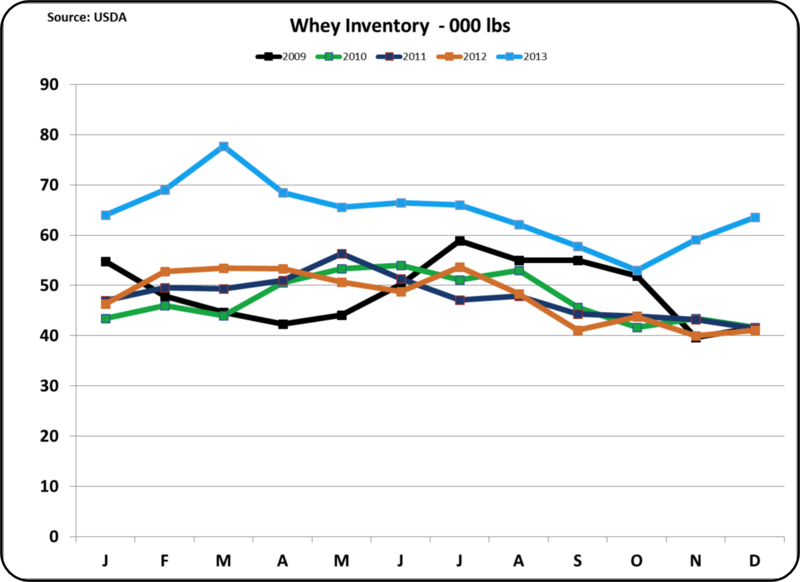 Whey inventories are not especially low, but exports remain strong and the price has remained stable. The NASS price of dry whey was $.60/lb. in January 2014. This was a ten month high for dry whey, which has kept "Other Solids" at a comfortable price of $.42/lb. This has allowed "Other Solids" to contribute $2.38/cwt. to the January Class III price. The unusual contribution made by the high price of Nonfat Dry Milk in 2013 deserves separate analysis and will be covered in a separate post. This unusually high pricing is driven by strong exports.